End of season greetings to all our guests and subscribers, from the Shenton Safaris team. 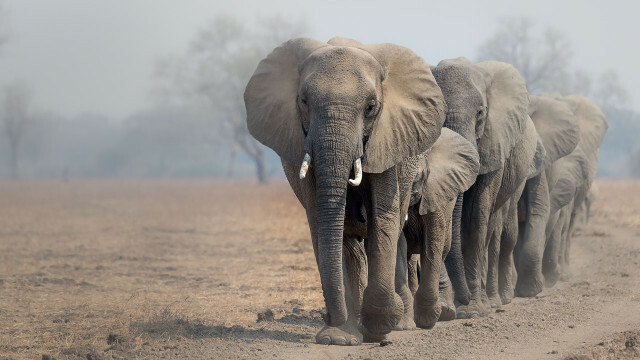 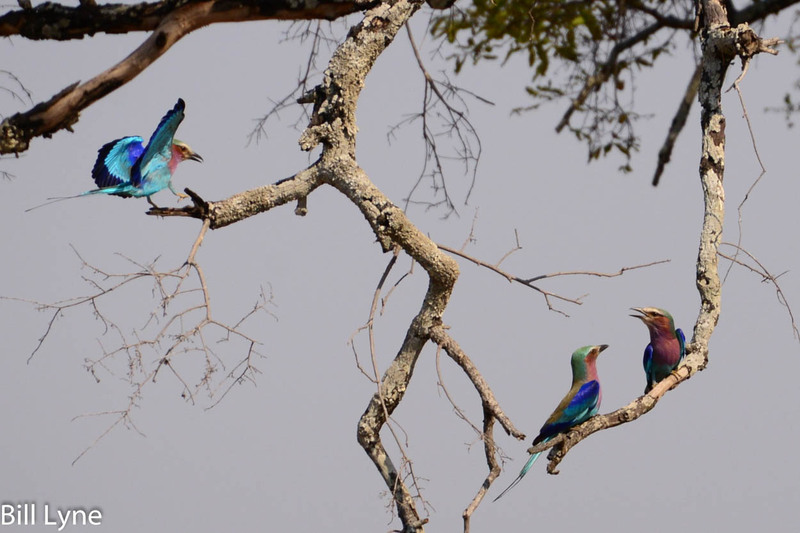 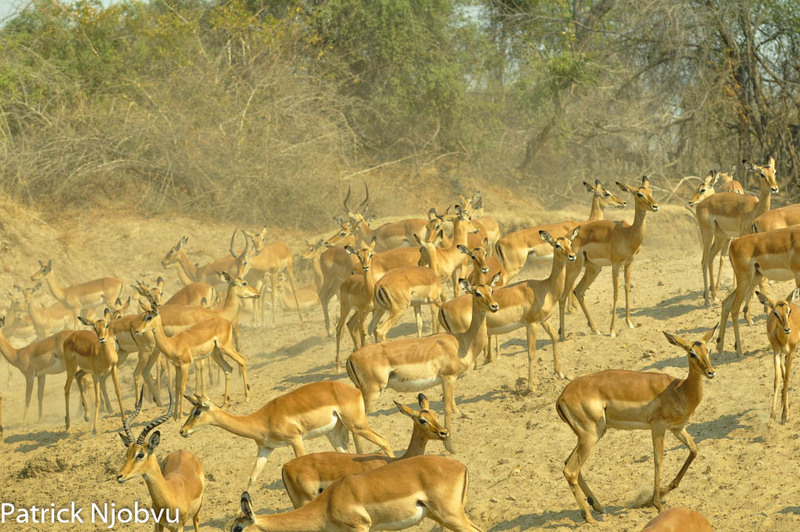 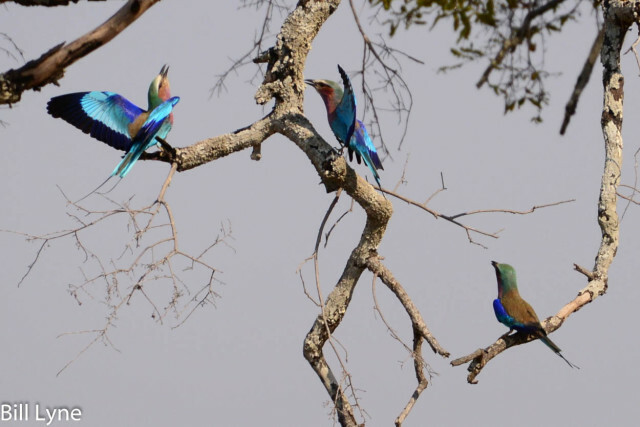 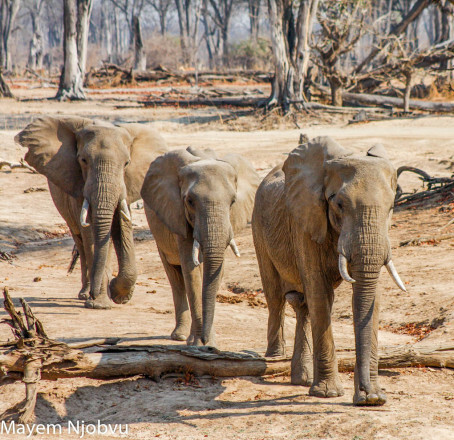 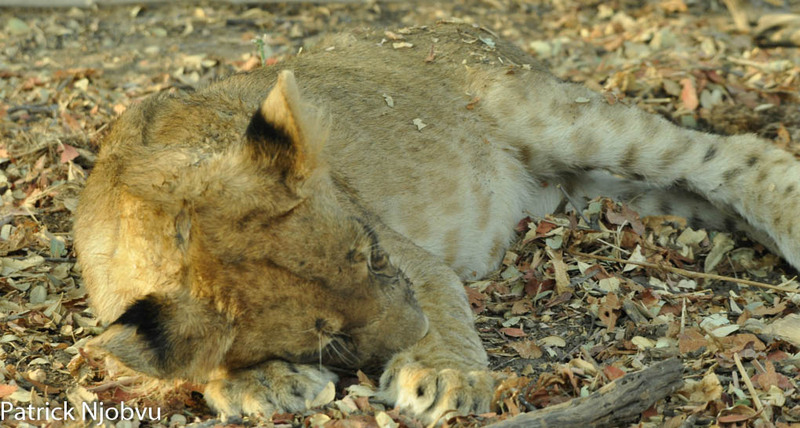 As the season closes and the South Luangwa National Park becomes drier and more bare, it is apparent that the whole area and its inhabitants are anxiously awaiting the November rains, to bring new life to parched earth. 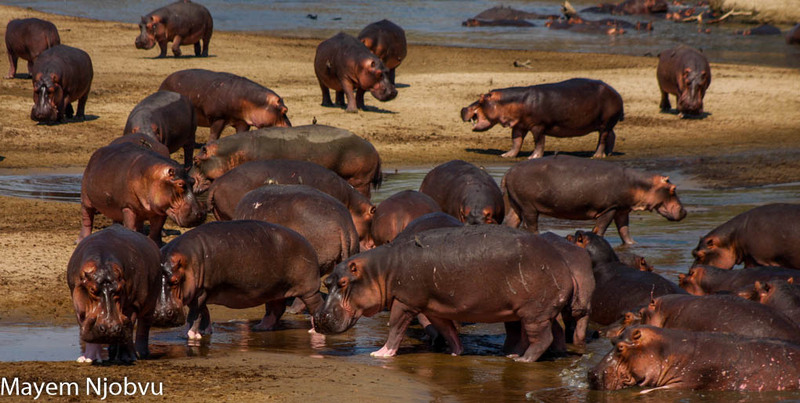 The Luangwa River in front of Kaingo Camp is merely a slow-moving trickle of warm water, where Hippos and Crocodiles fight daily for space. 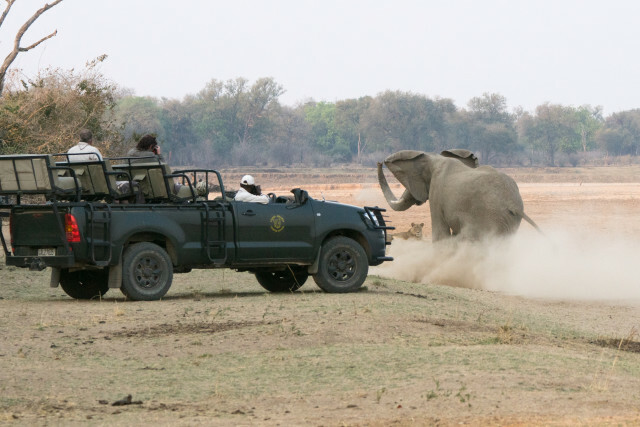 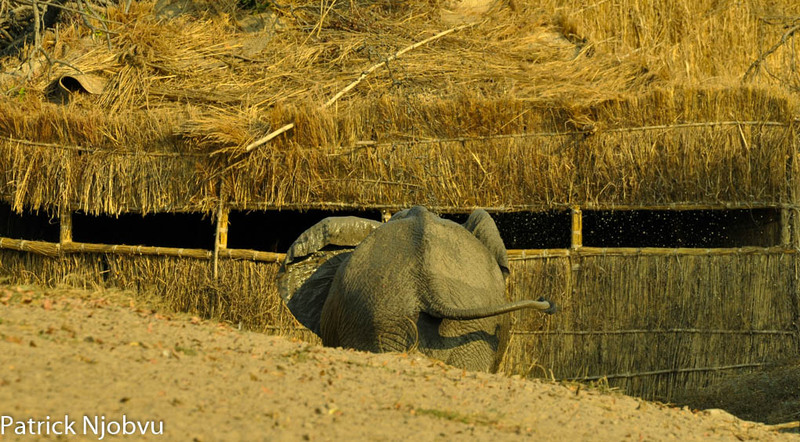 This has in itself brought about some exceptional game viewing, with the Hippo Hide and Mobile Hide being very active indeed. 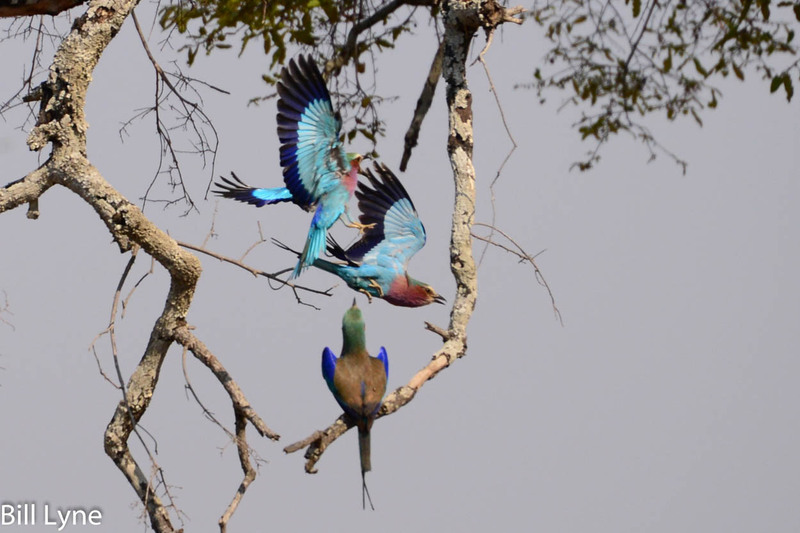 whilst Meve’s Starlings(Long-tailed Glossy starlings) and Grey-headed Sparrows allow a Lilac-breasted Roller to take centre stage. 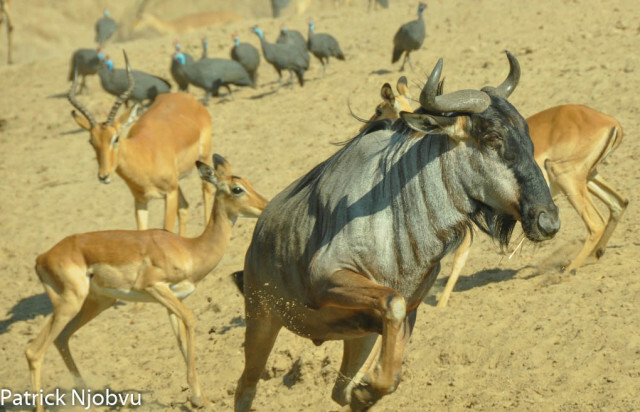 And an adult bull Wildebeest reacts to one of the many alarms that add to the cacophony of bird calls. 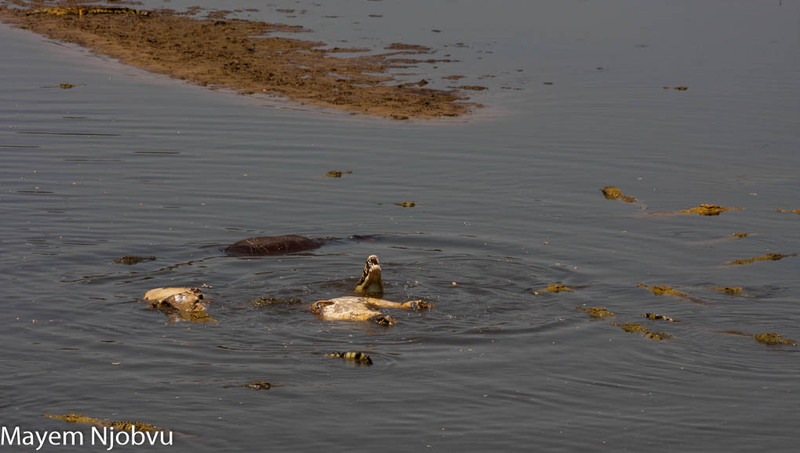 Earlier in October there was a casualty at the Hippo Hide and we found the carcass of an adult hippo in the water close to the hide. The carcass remained untouched for a number of days, swelling in the sun and guests David and Jane Collins observed some unusual behaviour while sitting in the hide. 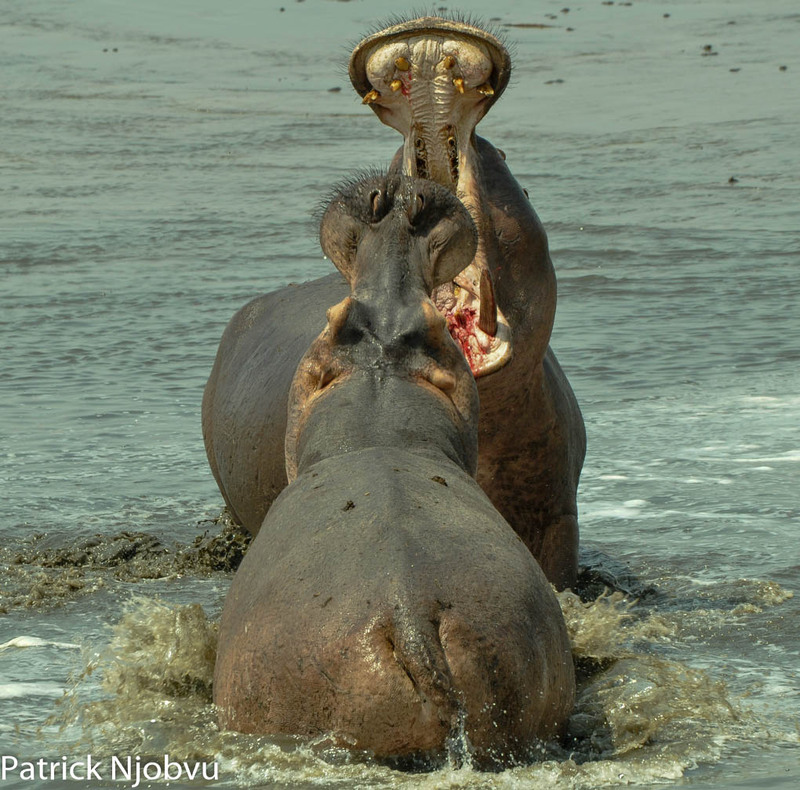 The other Hippos seemed to be protecting the carcass from growing numbers of crocodiles, who were moving ever closer and closer to the carcass and a potential meal. One brave baby Hippo gave chase to a huge crocodile who came too close to the carcass, surprisingly scaring it away, albeit temporarily. 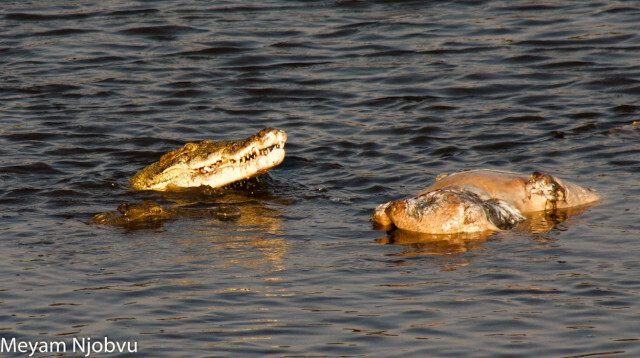 Fortunately its efforts only kept the predators at bay for so long and within that day the carcass was surrounded by many crocodiles, who quickly disposed of it, ensuring that it did not reach a state of odious putrefaction. 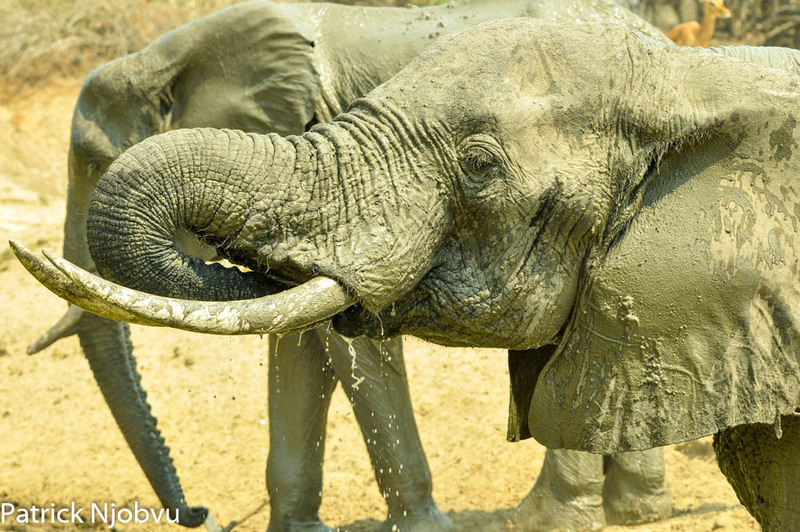 The Last Waterhole has played host to many Elephants, who have continued to come down throughout the day to cool themselves off from the harsh October heat, many of them so close to the Mwamba hide that the guests become the recipients of their cooling mud too. 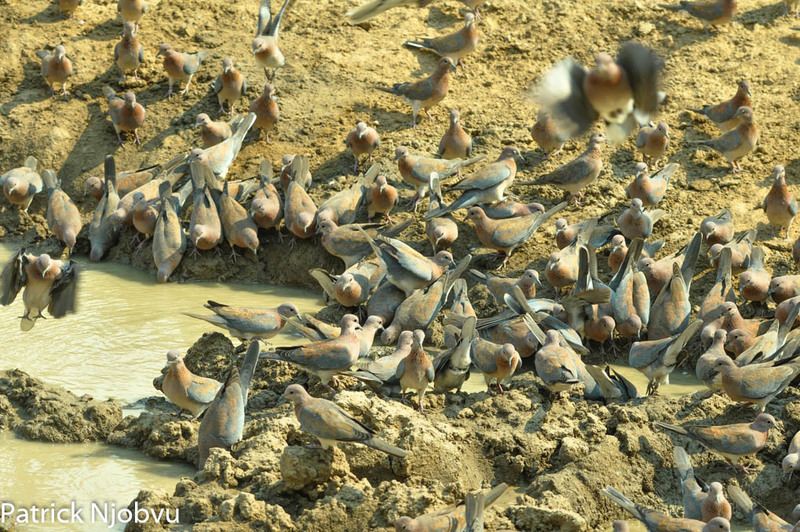 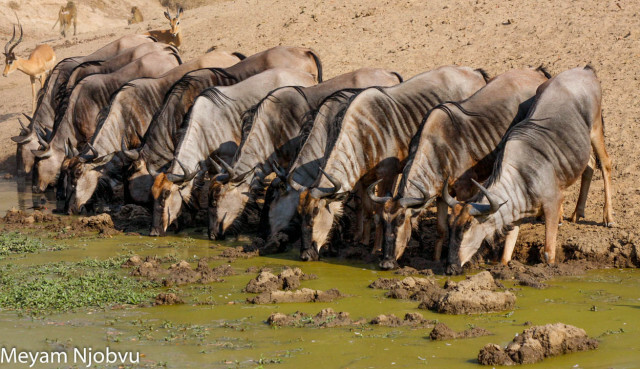 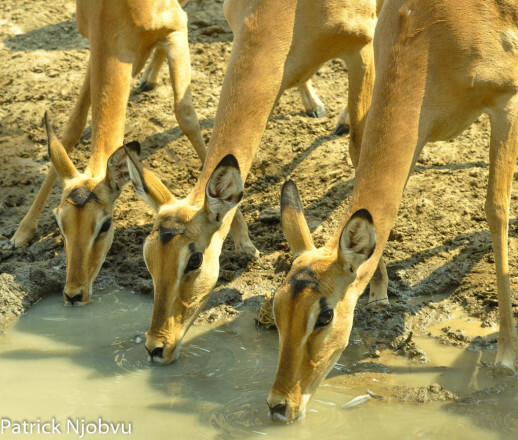 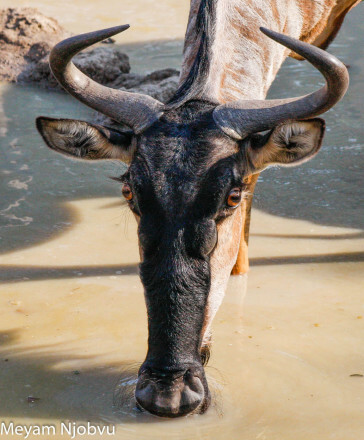 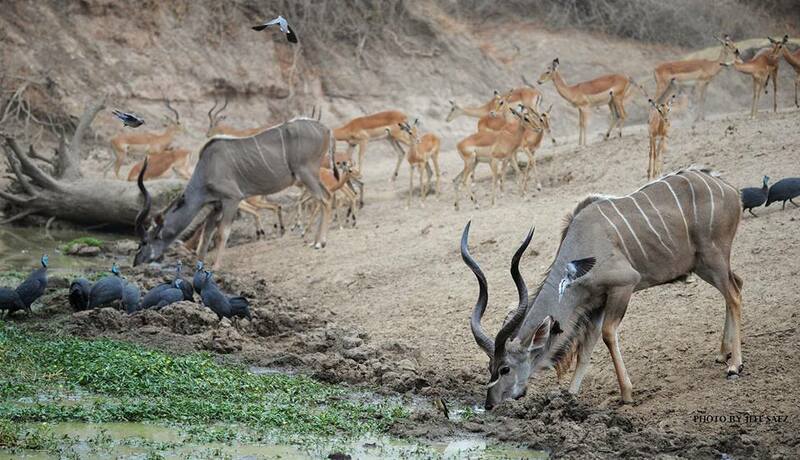 And the countless Wildebeest, Impala, Kudu and Bushbuck, side by side with thousands of birds, have benefited wonderfully from Shenton Safaris’ innovative waterhole. 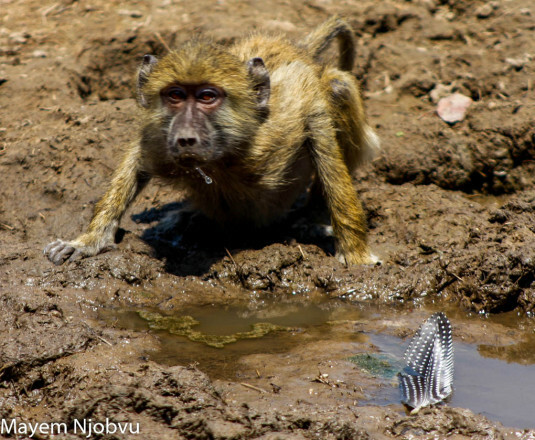 and a young Yellow Baboon sucked water quickly from an Elephant’s footprint. 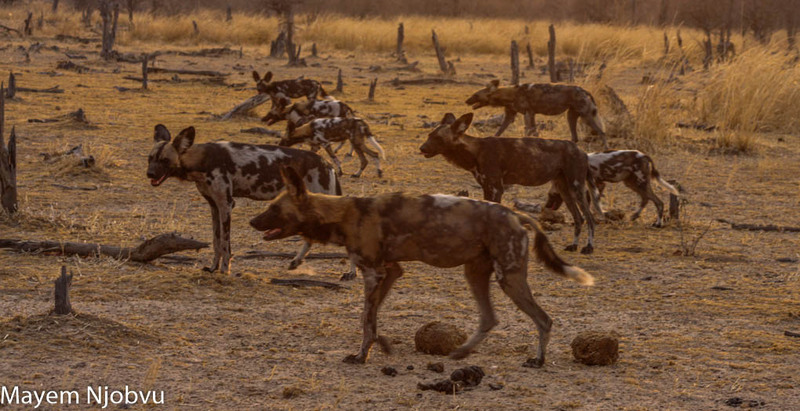 This plethora of game brought in by the fresh, sweet water meant that the month started with a bang at Mwamba Bushcamp, when a pack of 10 wild dogs turned up at The Last Waterhole. 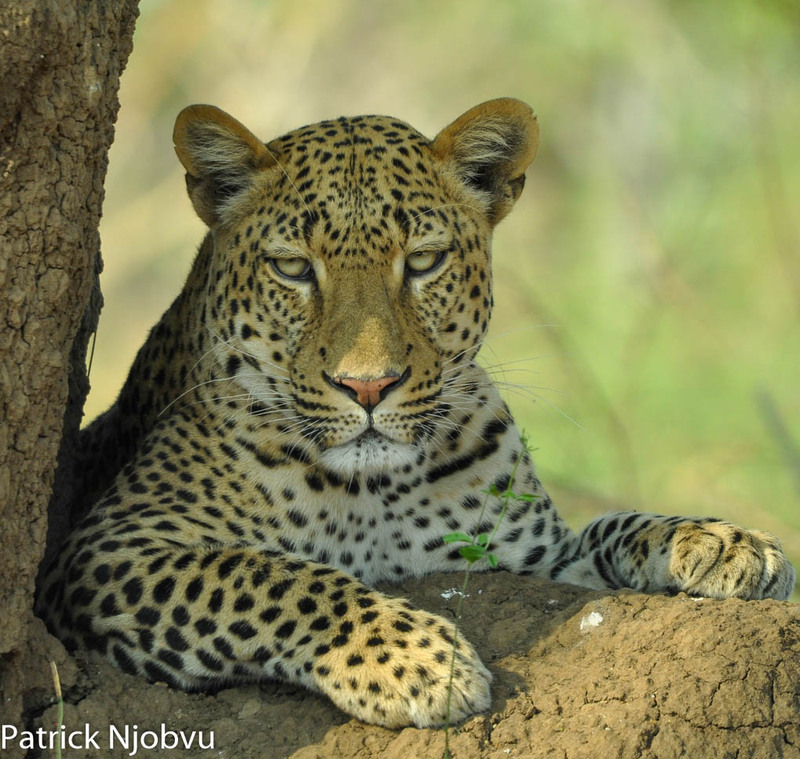 Although they did not stay for long in front of Mwamba’s hide, they remained in the area around their den for the following two weeks, giving us wonderful sightings of these endangered carnivores. 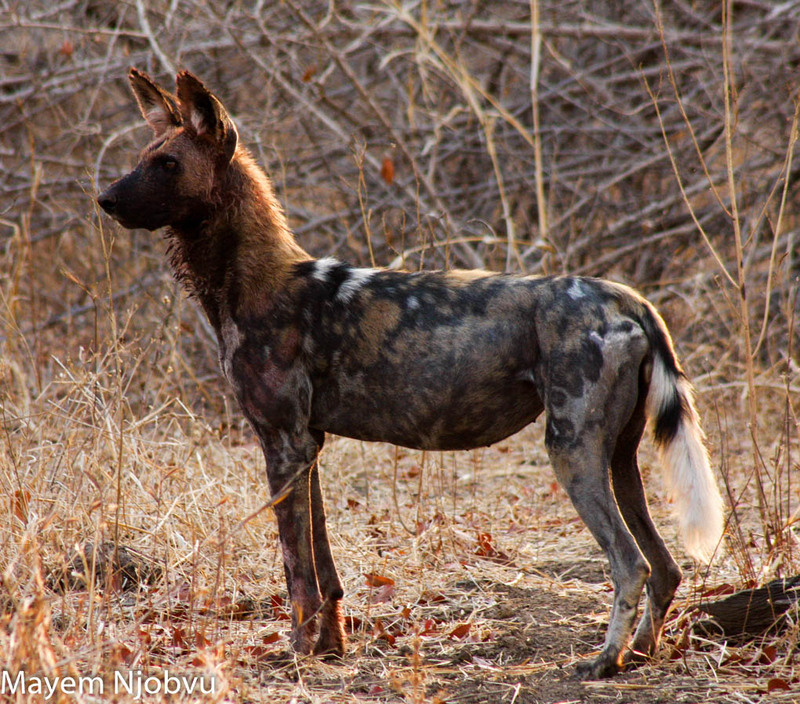 Matt and his guests had one wonderful sighting of the Wild Dogs when they spotted the adults hunting impala. 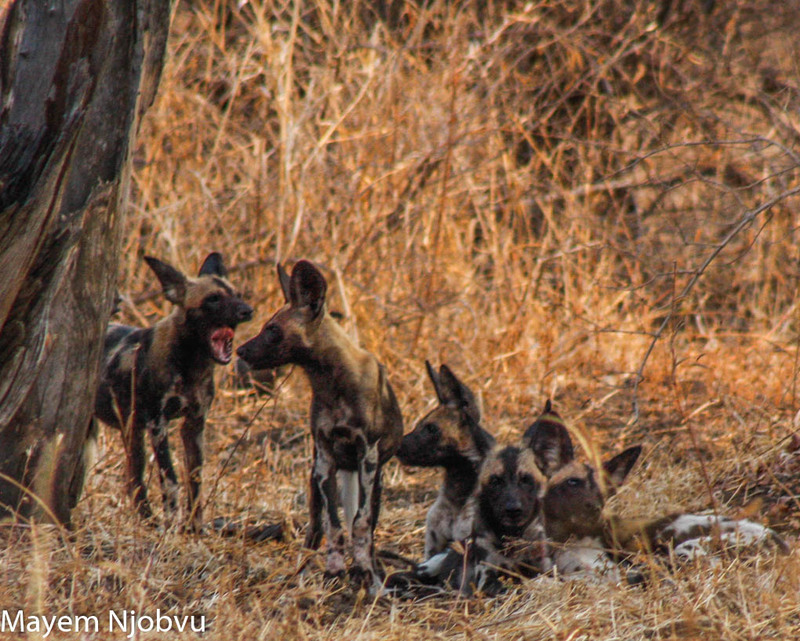 Although they missed the actual kill they were lucky enough to catch up to the pack just as the alpha female was feeding her 4 month old pups, regurgitating large chunks of fresh meat at their insistent pleading. The Dogs managed to make two kills close to Mwamba Bushcamp that we noted, over the course of their time here and came into conflict with Knobby, a new male lion in the area, over one of the kills. 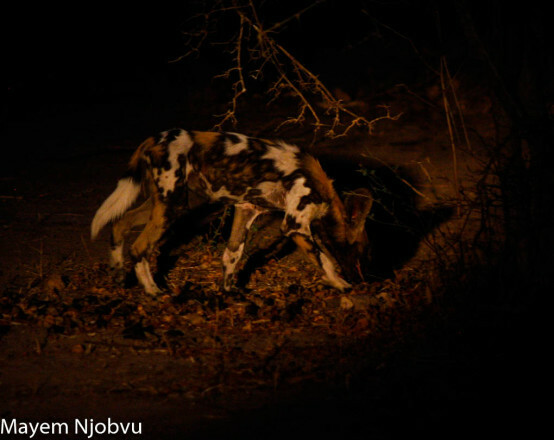 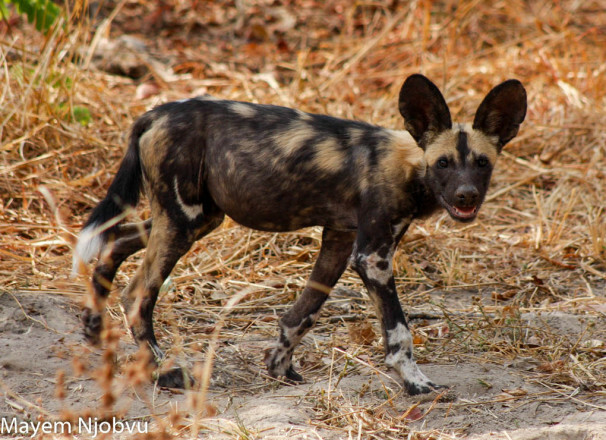 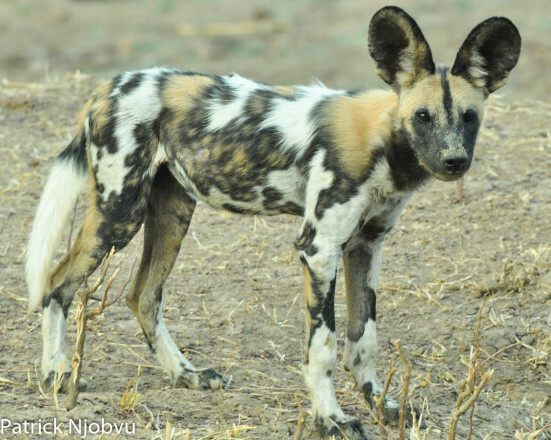 The pack of Wild Dogs were seen on numerous occasions by guests of both camps and on most occasions all 6 pups and 4 adults were on view. 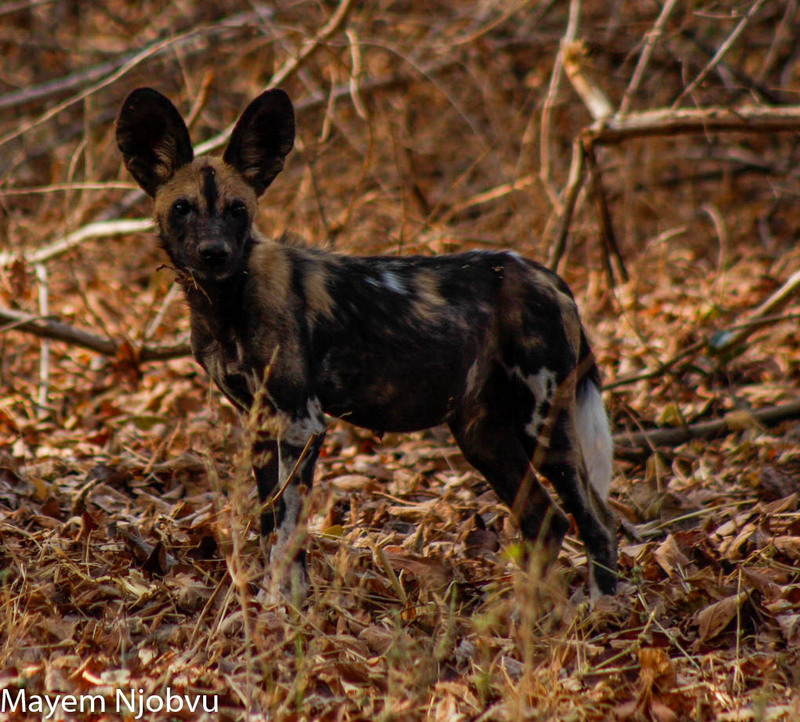 Unfortunately by the time that they left the area, they had lost one of the pups to inter-species conflict, but with any luck the remaining pups will make it through the rains and provide us with wonderful early season viewing next May. 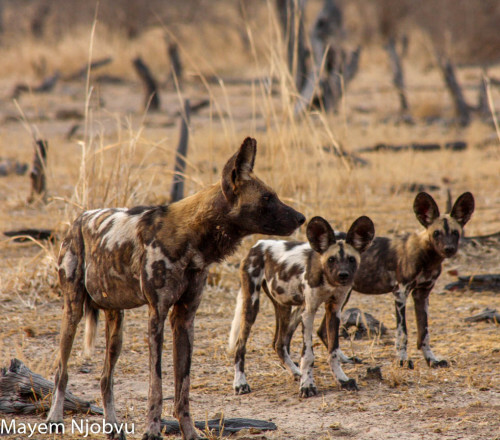 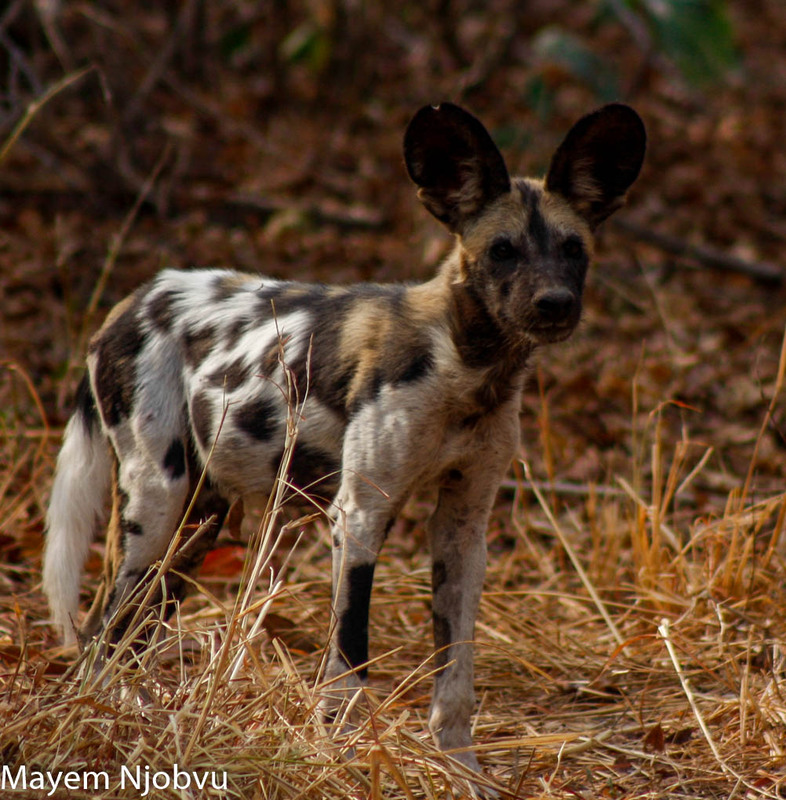 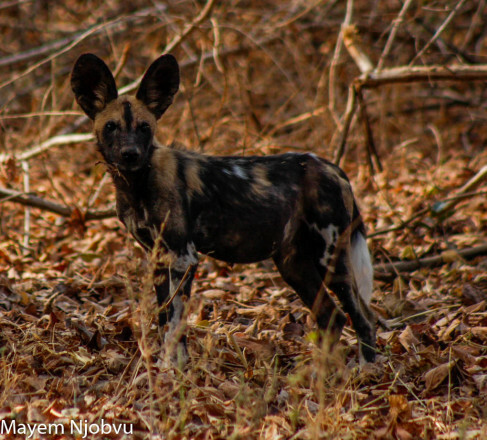 In the beginning of October we were delighted when Meyam arrived back from an afternoon game drive with news worth smiling about – he had located the Hyena’s new den and could confirm that both Hyena pups that were first seen in August, were alive and well. 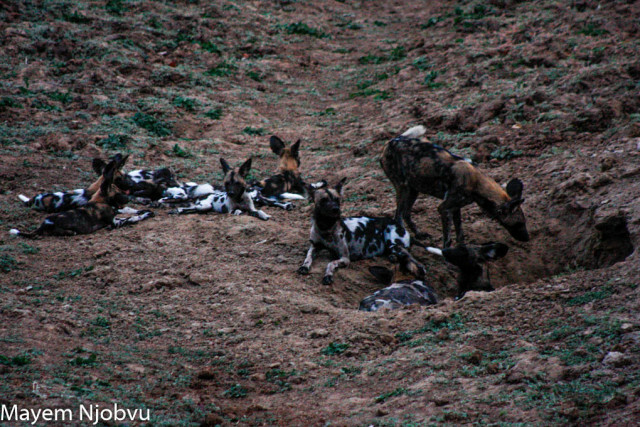 And there were also two other Hyena pups in the den, these ones about 2 months older than the pups we had found in August. This was great news for us, as it had been a cause for concern when the original den had been abandoned back in August. 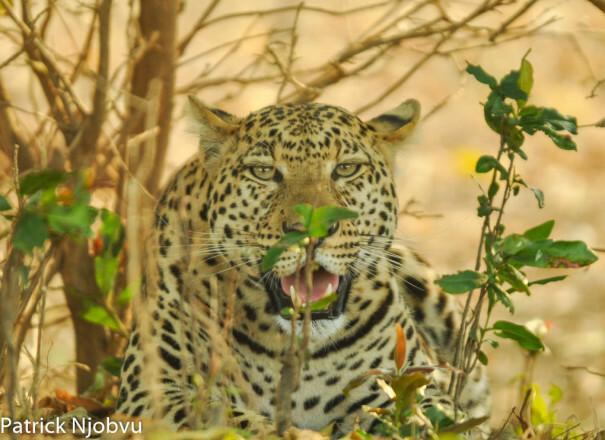 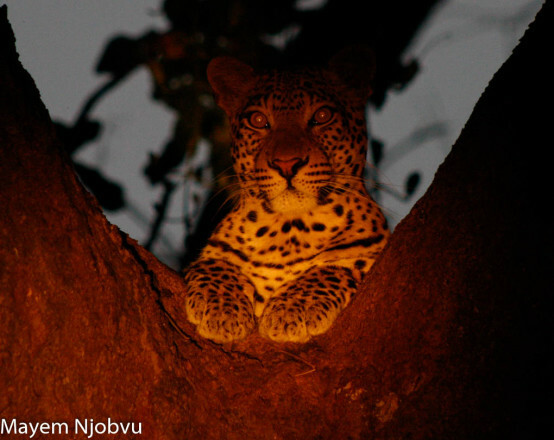 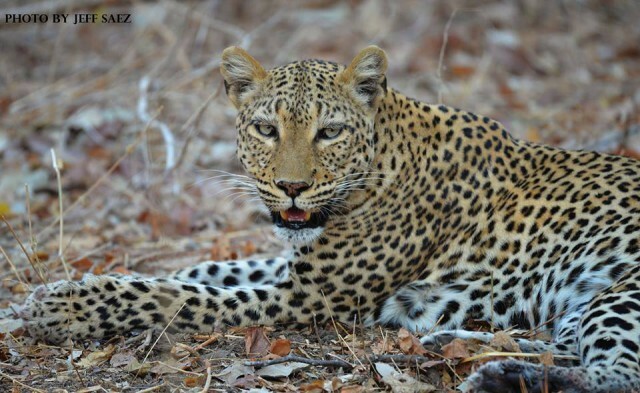 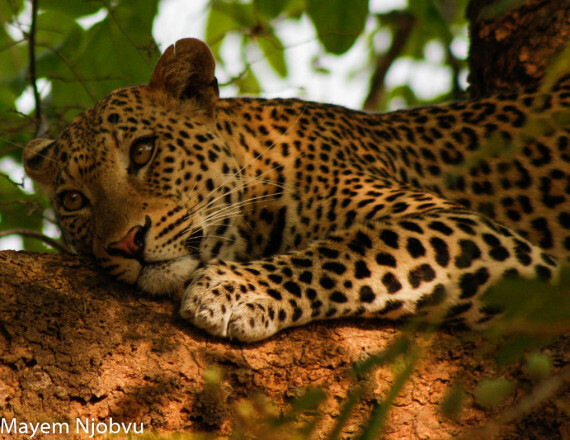 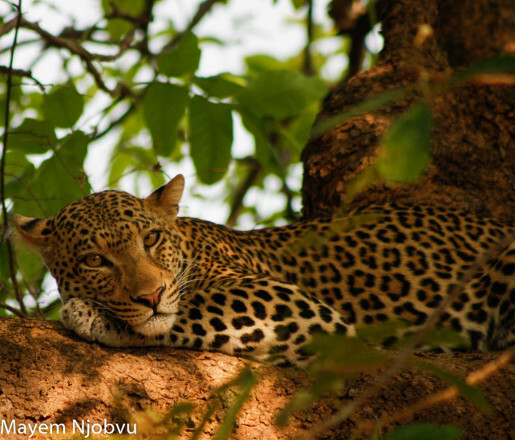 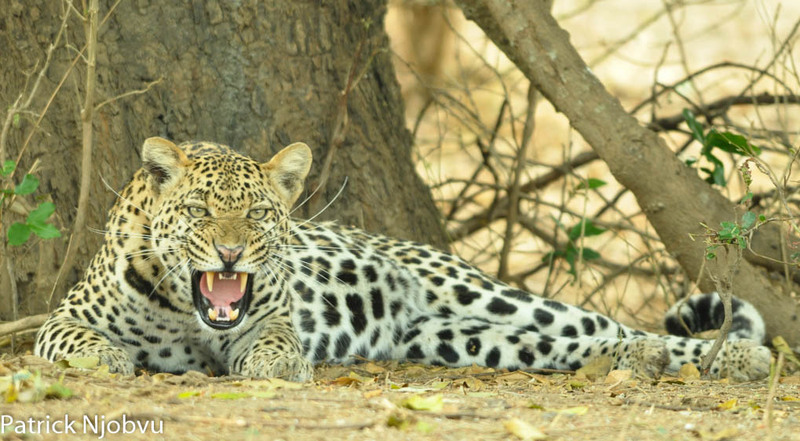 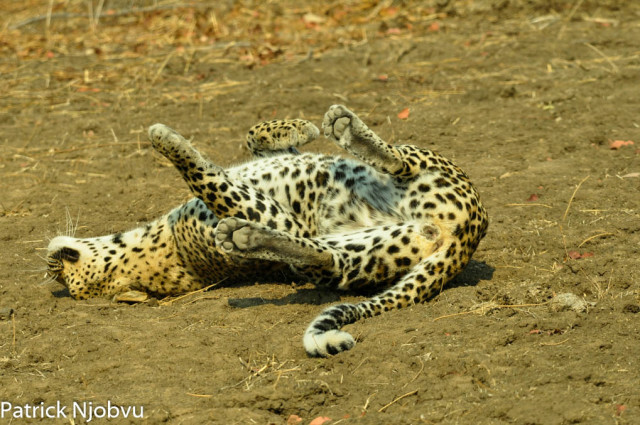 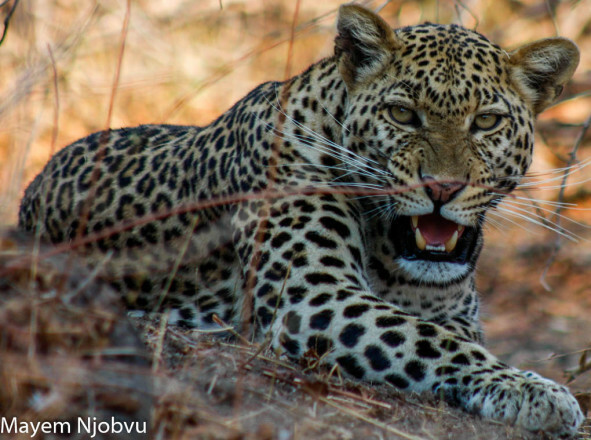 Our residents Leopards have continued to enthrall guests with their proximity, some notably happier to see humans in vehicles than others. 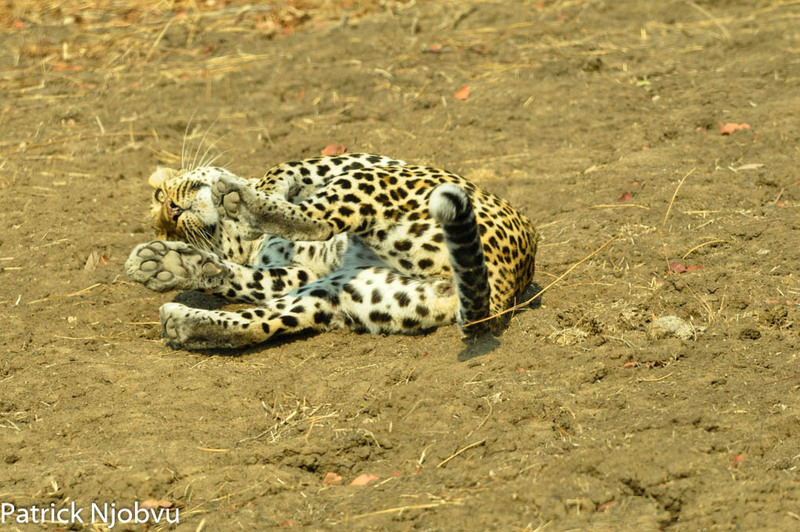 Beautiful Chiphadzuwa finishes a young Puku left for her by her mother. Mapolo-ya-molilo showed his patience and complete disregard for a troop of Baboons above him in the tree as they yelled abuse and hurled sticks and leaves in his direction. 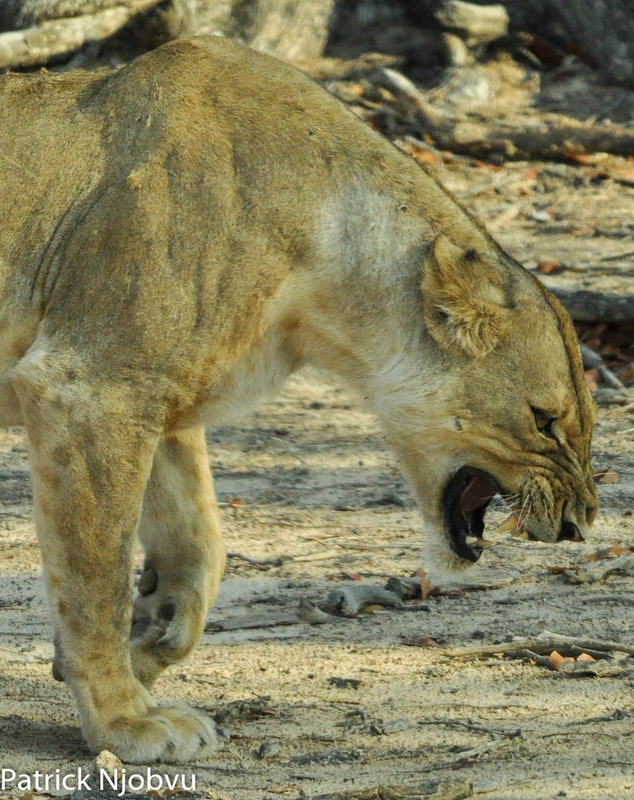 but one mature female stared on impassioned. 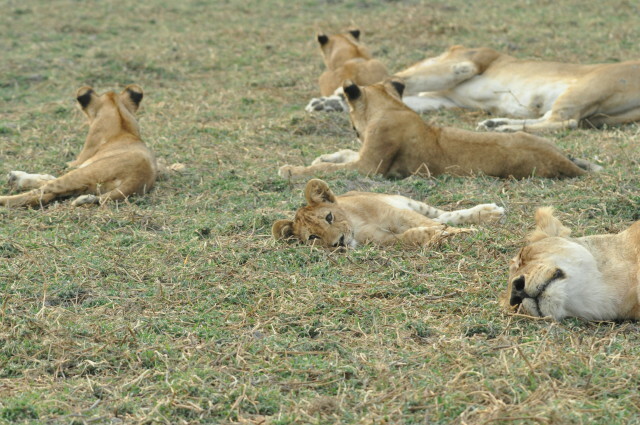 Lions have always been a main stay at Mwamba Bushcamp’s Last Waterhole and the constant influx of game to the water ensured that Lions remained in constant attendance, waiting in patient ambush. 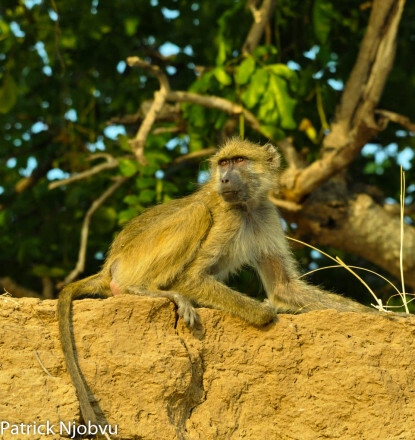 The surviving Mwamba male, who had staked out his territory closer to the Kapanda lagoon, made the trek back to Mwamba at the beginning of October as the lagoon dried up. 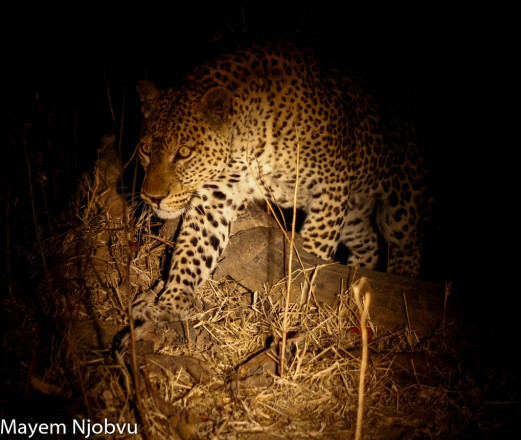 He followed the surviving Mwamba females and their four cubs. 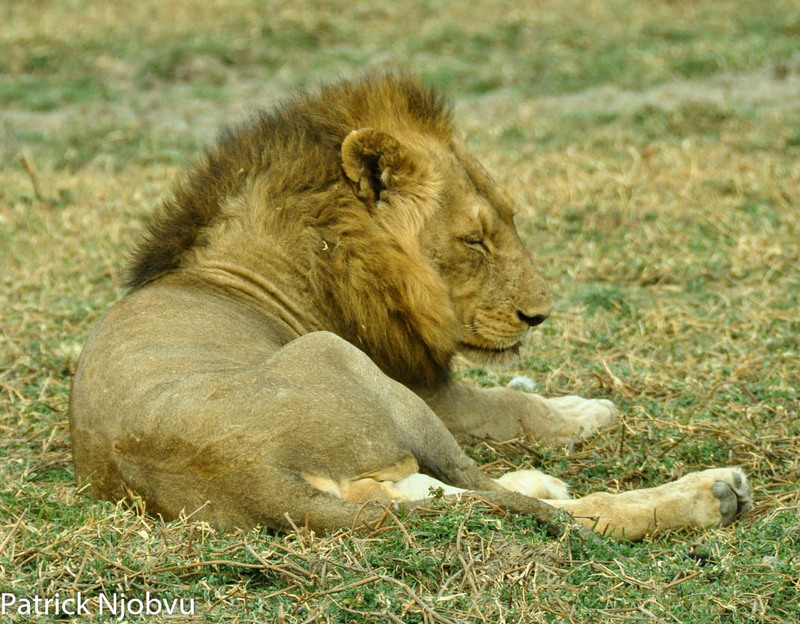 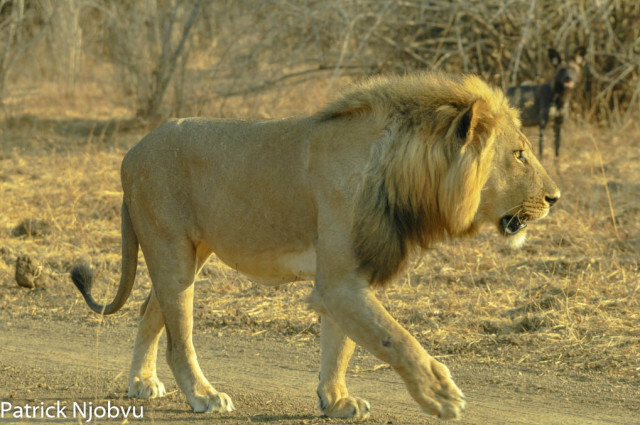 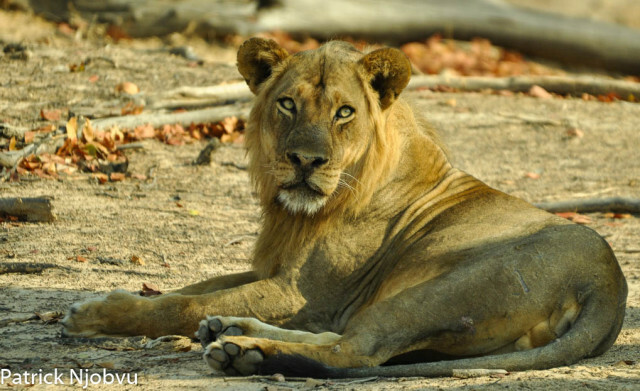 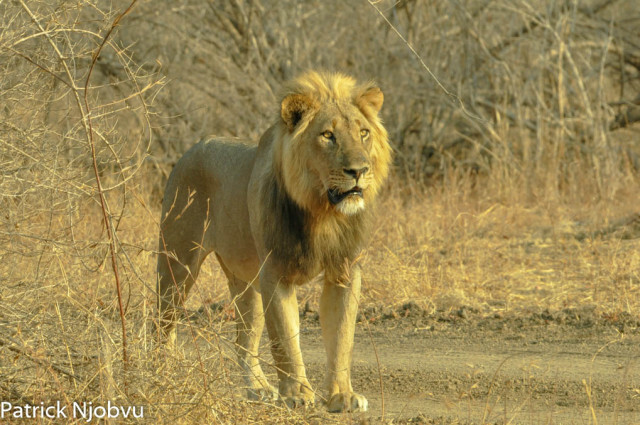 Their presence in the area brought a new dynamic to the Lion populations at Mwamba. Knobby, the male lion who recently moved into the area in the absence of the Mwamba male, seemed to have taken control of The Last Waterhole, and subsequently began searching for the intruders with booming territorial calls. 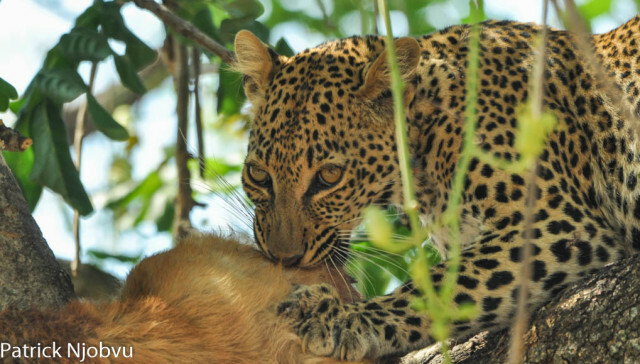 The females killed a young buffalo and the pride immediately began to feed, leaving the internal organs to the Mwamba male, who has been seen to struggle recently, to cut bites of meat with his worn-down teeth. 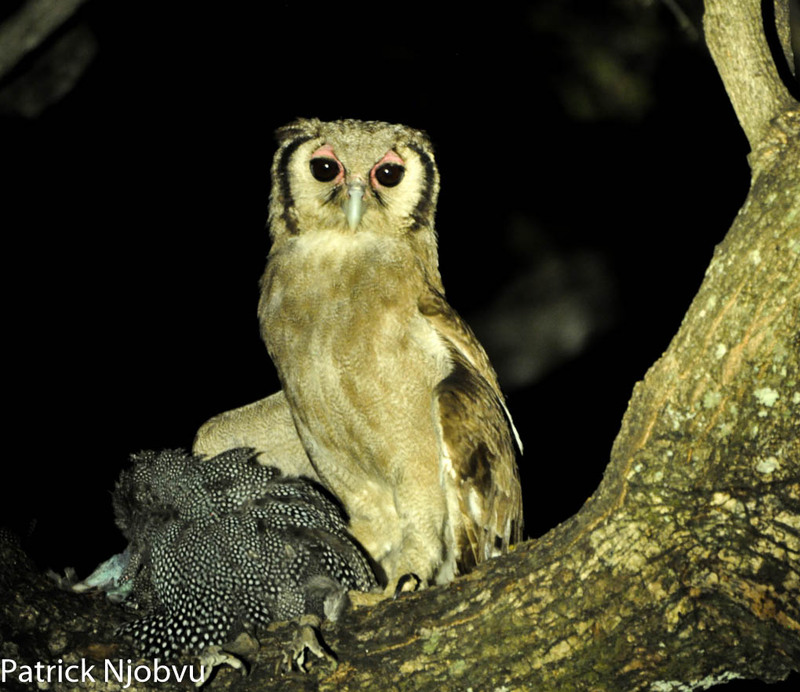 The knock-on activity around the kill brought Knobby rushing back in and in the early hours of the morning of the 29th, in pre-dawn darkness, the males met and fought for the right to rule this area. 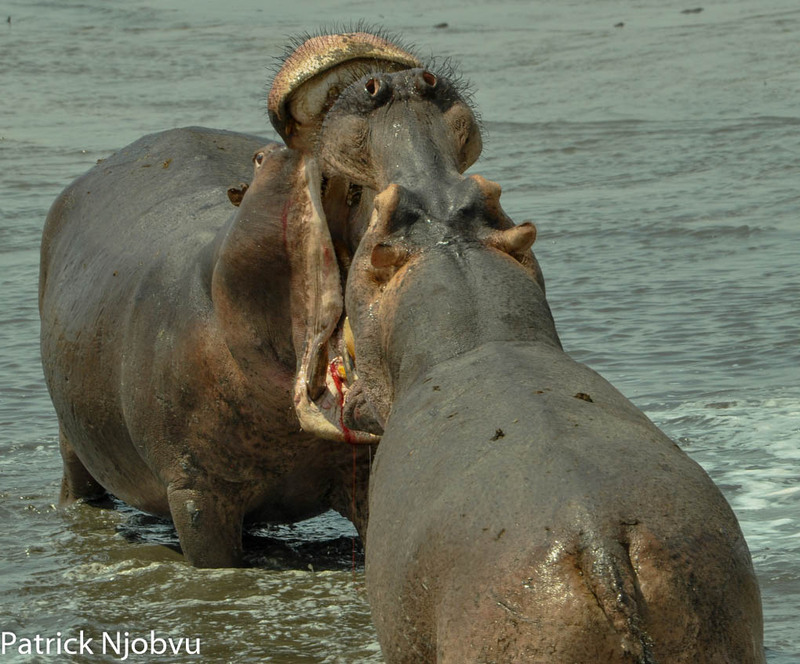 Mwamba translates as Heaven and with its abundant game, guaranteed water and resident females, is a prize worth fighting for. 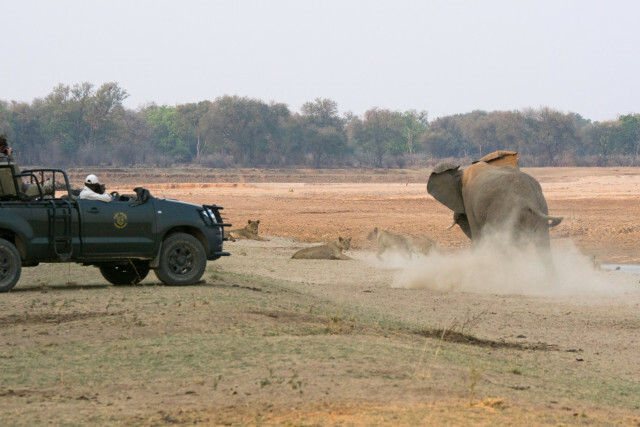 They chose the thick brush opposite of where we have our morning tea and coffee for their battleground and the sounds were enough to ensure that most guests had an early start to their day. 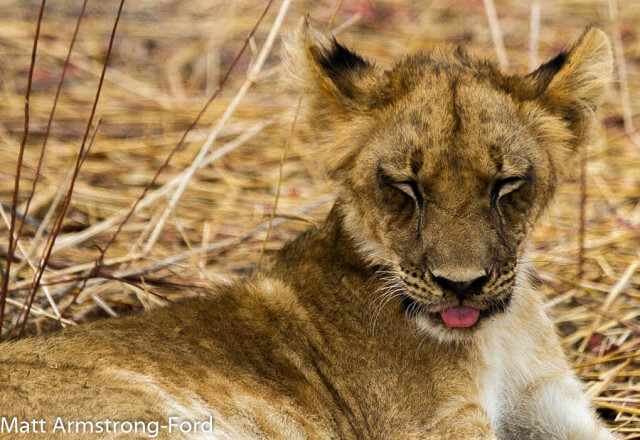 but unfortunately, despite the attentions from their mom and their aunt, neither of the cubs survived the savage battering. 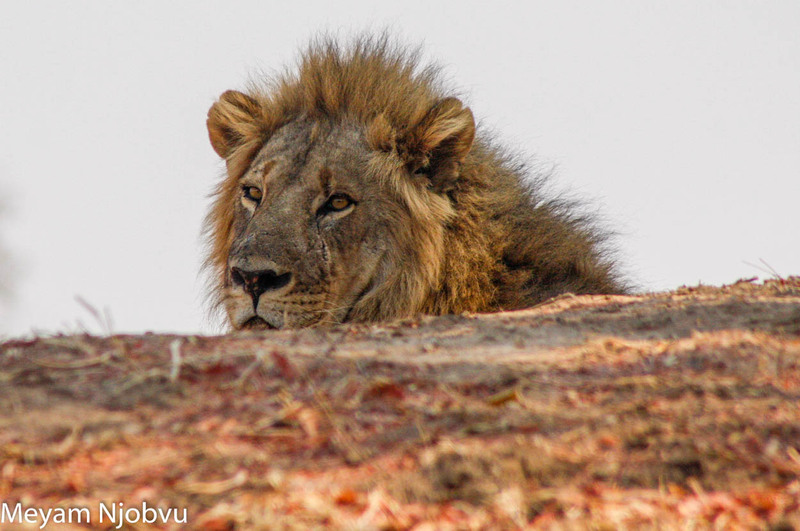 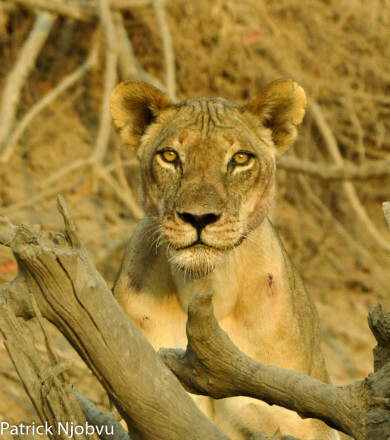 The pride has moved away from the killing ground, possibly in attendance with the new male. 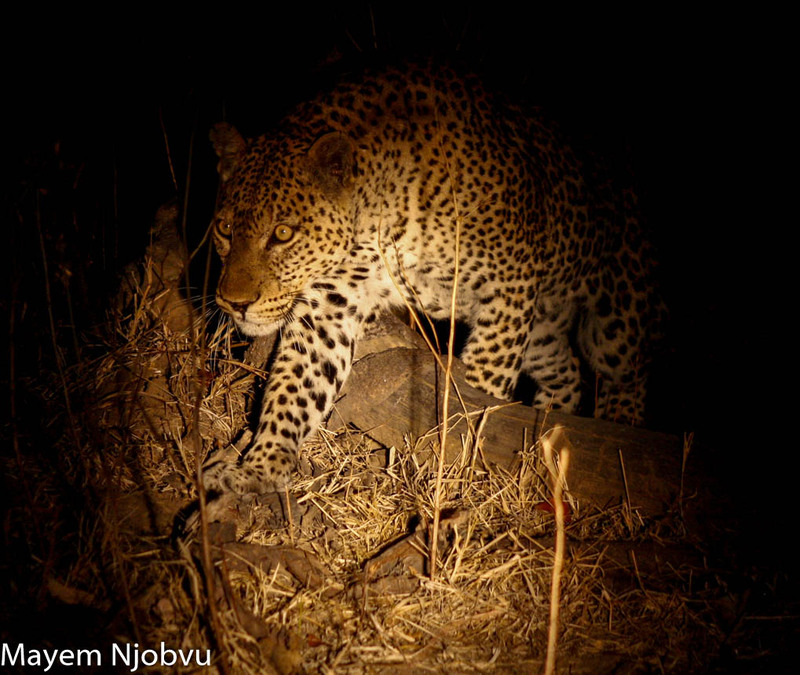 That night, the forlorn calls of the surviving Mwamba male carried over the still bush, crying out his loneliness, close to where his brother died last year. 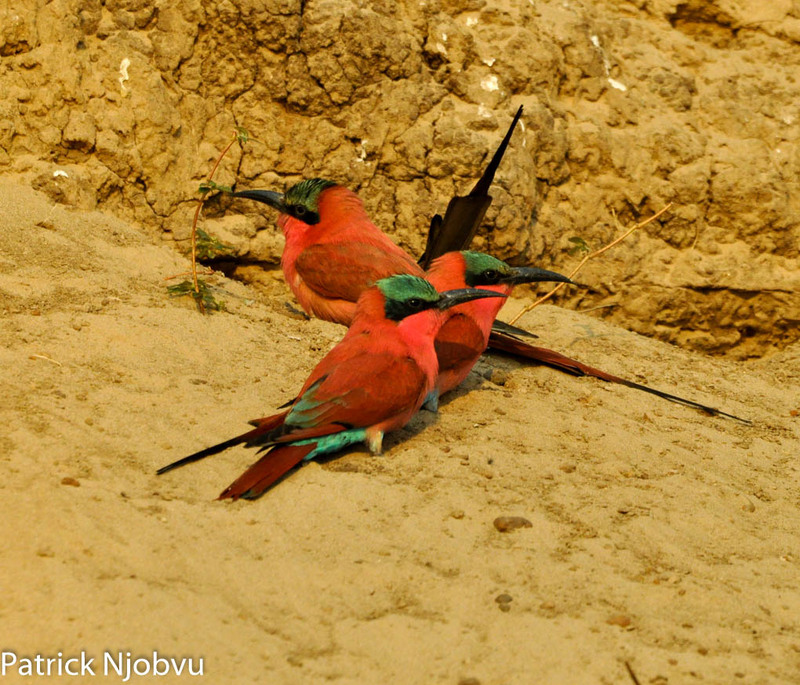 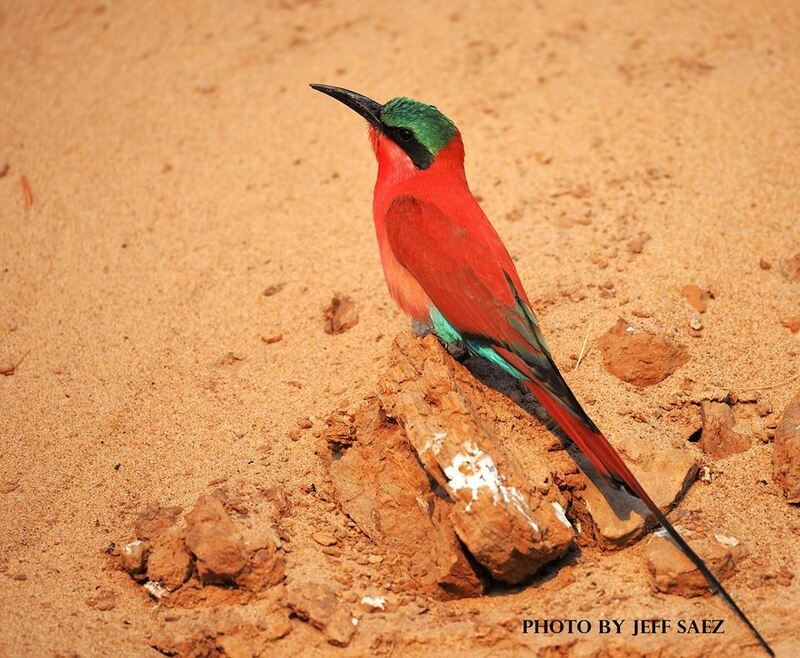 At the beginning of the month the Carmine Bee-Eater colony continued to excavate their nesting burrows. 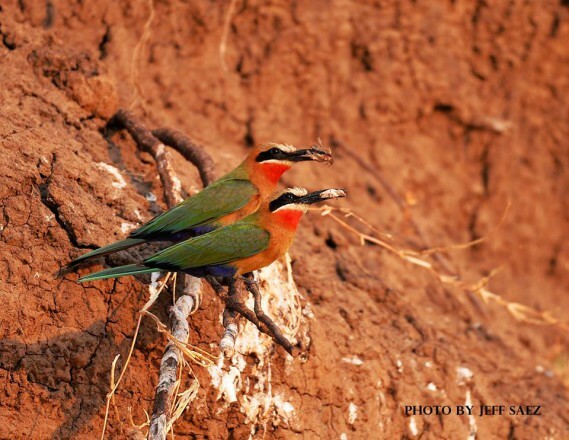 But as the month wore on, with the nests completed, breeding started in earnest. 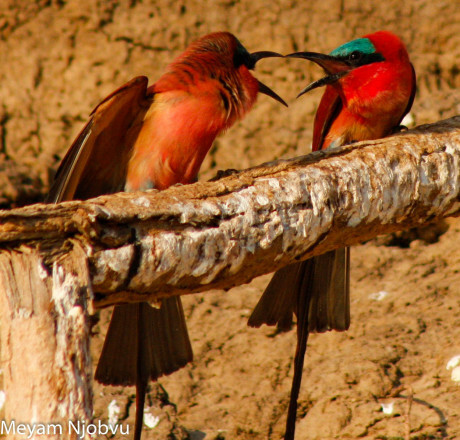 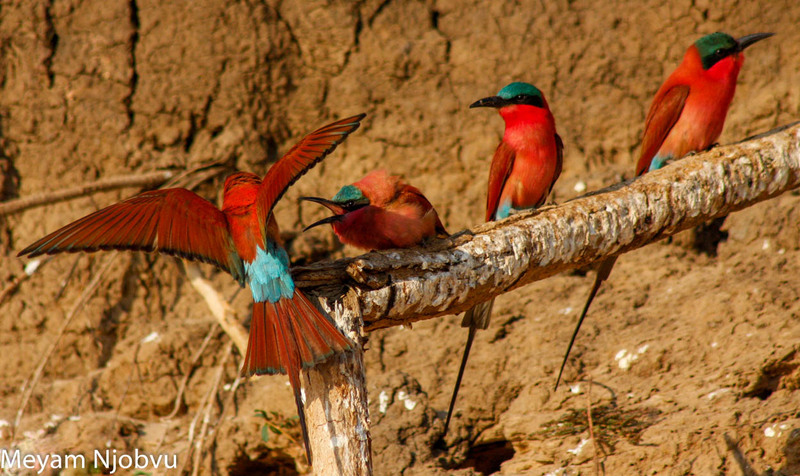 Early one morning at the beginning of October as guests Jeff Saez and Antonio Gracia sat in the Carmine Bee Eater hide they observed some unusual and somewhat disturbing behaviour from the Carmine Bee-eaters. A mating pair were busy excavating what the guests assumed was their nesting burrow. 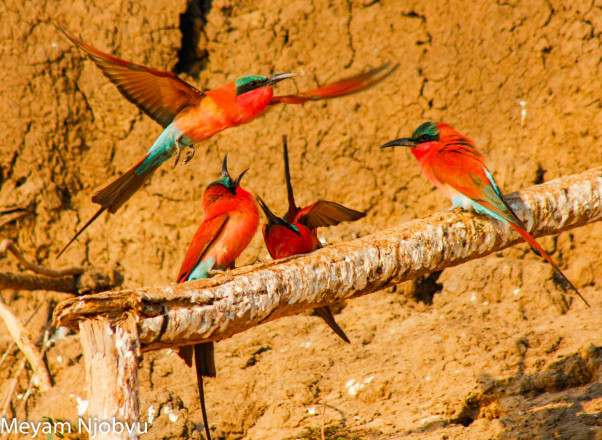 But as the guests watched, the Carmine Bee-eaters had usurped a White Fronted Bee-eaters nest and proceeded to evict the undeveloped chicks, dropping then on the bank in front if the hide, to make way for their own chicks. Another reminder that life in the African bush, although unequaled in its beauty and wonder, can also be harsh and brutal. Bill and Lucy Lyne sent us some colourful photographs of a Lilac-breasted Roller love triangle developing as an interloping male landed close to a mating pair. 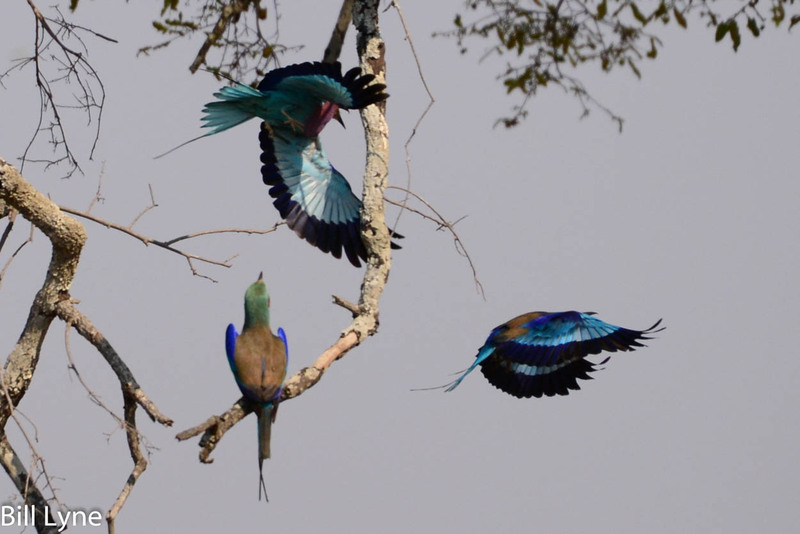 The male took umbrage at this intrusion and advanced to display his wares, receiving a display in reply. 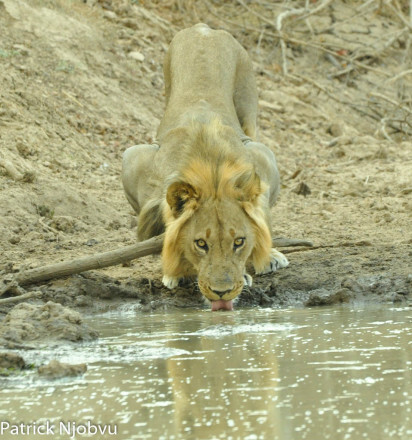 and was properly seen off by the victorious male. her stress glands weeping copiously as she maintained the comfort zone. Malaika found something particularly odourous to roll on and then moved instantly into a stalk as she spotted some Pukus. 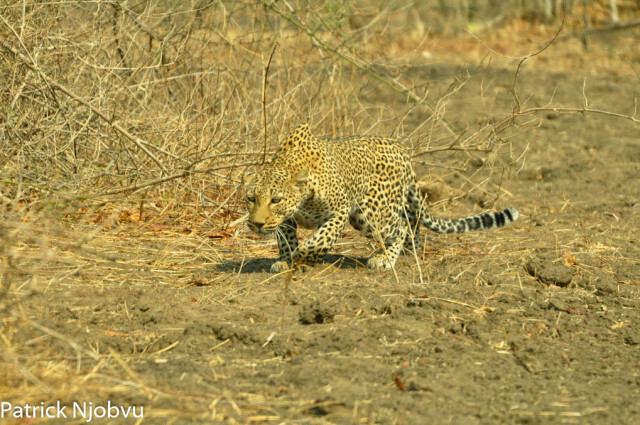 And here is a selection of photographs from guides and guests from October. 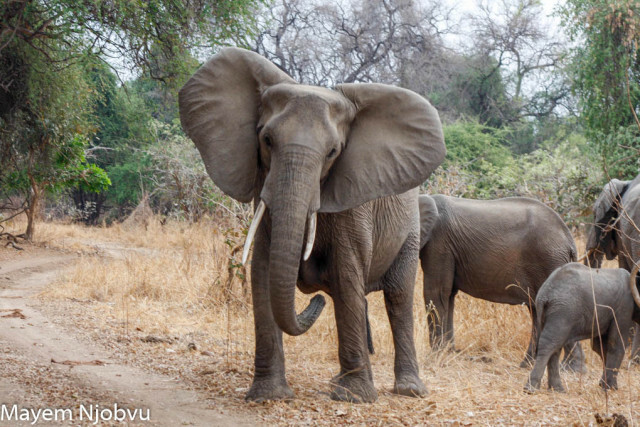 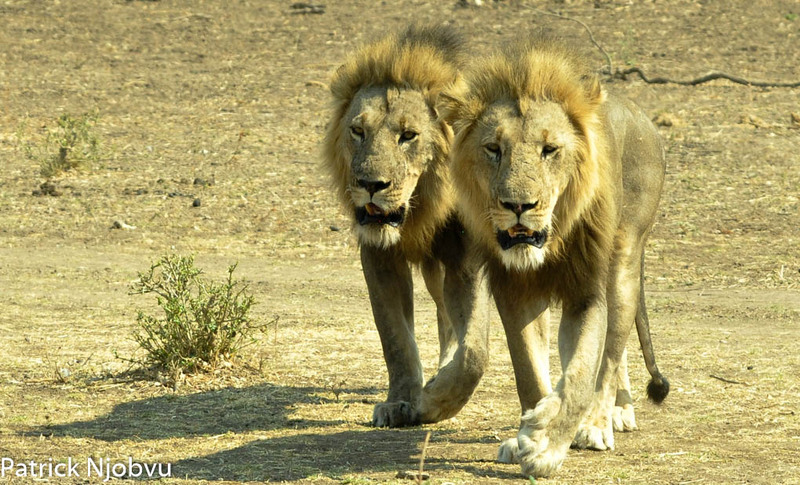 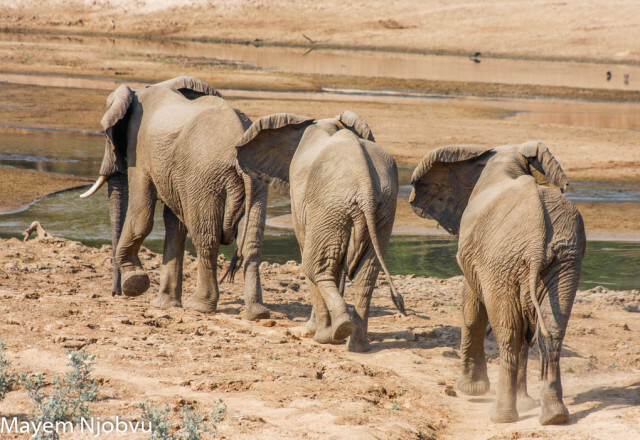 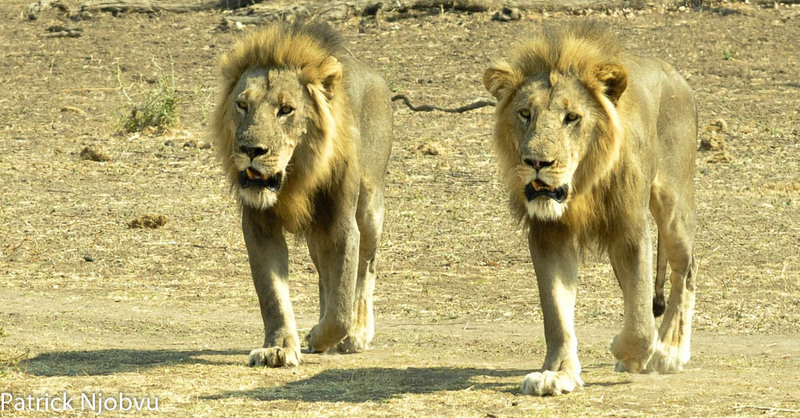 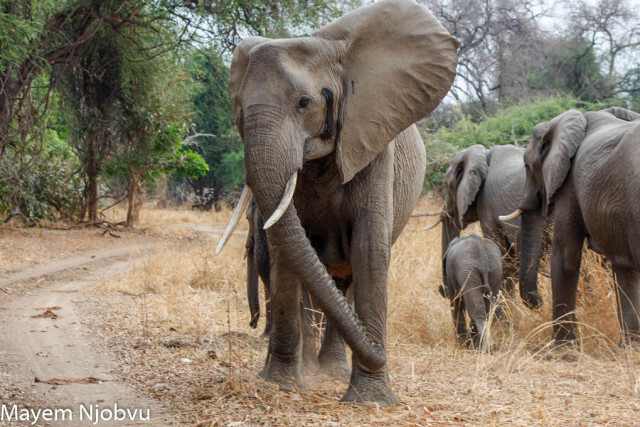 Tangua and Nyuma, the Hollywood and Nsefu males strut their stuff. 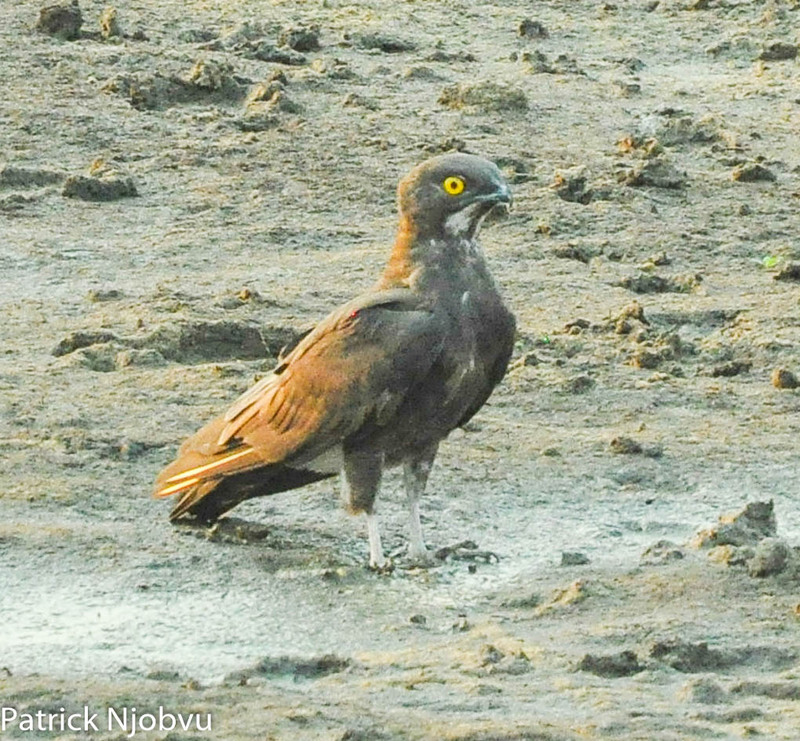 A Bat Hawk, uncommonly seen on the ground. A young Lioness growls with her head lowered, submitting to the presence of a male. 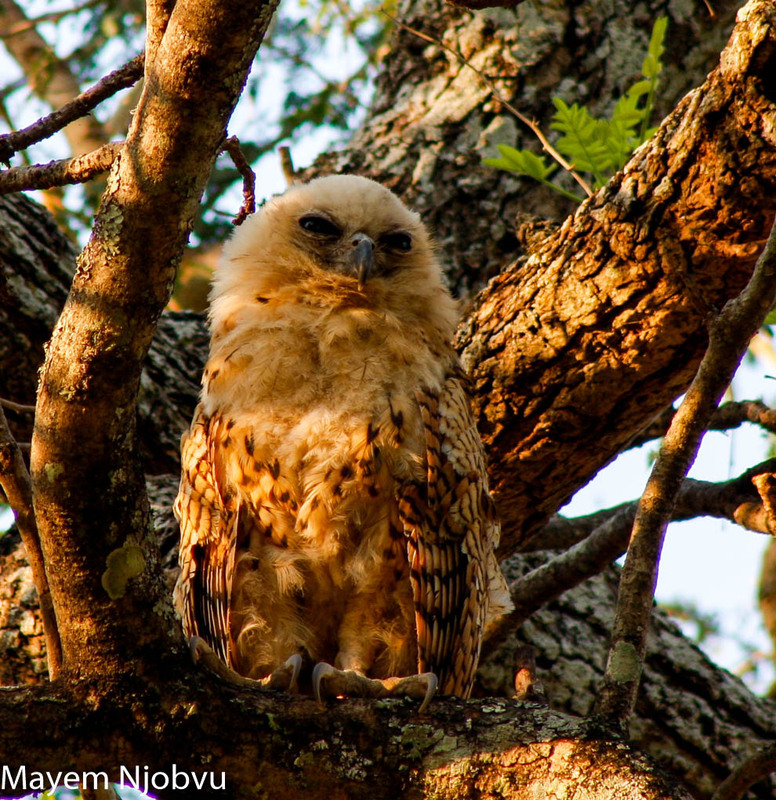 and a young female Yellow Baboon perches above the colony, opportunistic as ever . . ..
A Verreaux’s Eagle owl displays its power by lifting a Guinea fowl high into a tree. 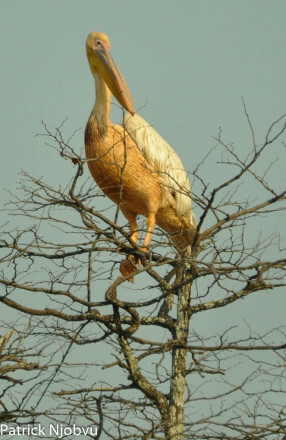 Often seen on our side of the river, albeit briefly during fishing party activity – the Great White (Eastern) Pelican. 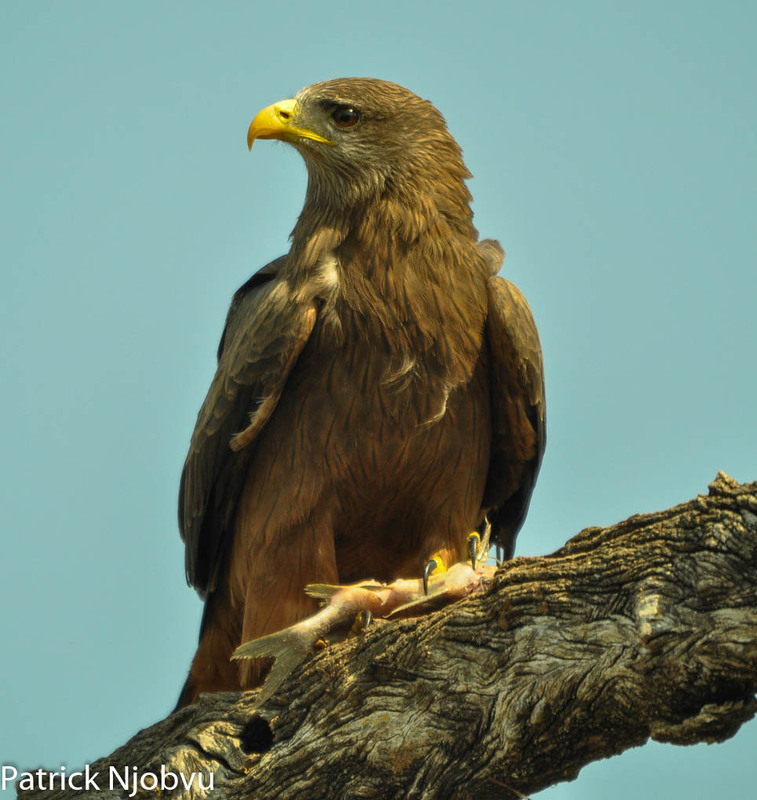 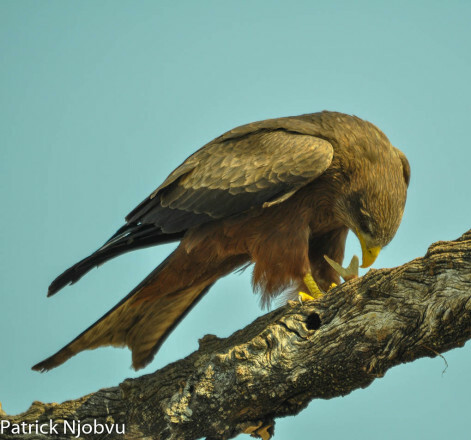 A Yellow-billed Kite, more commonly seen as a scavenger but here with a freshly caught fish. 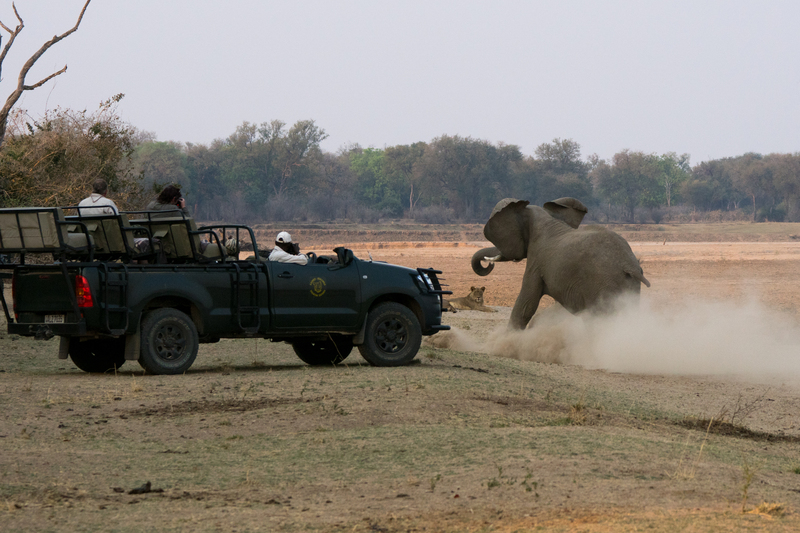 The last of our guests have left and the rain clouds are looming ever closer – time to say goodbye, and good luck, to all the wildlife and to shut up the camps until next year. 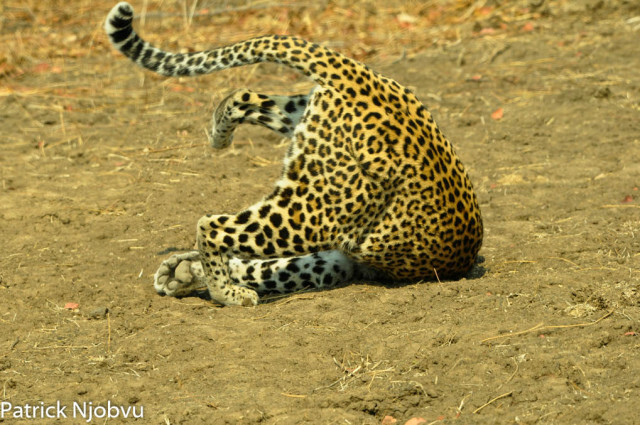 This is all until next month.